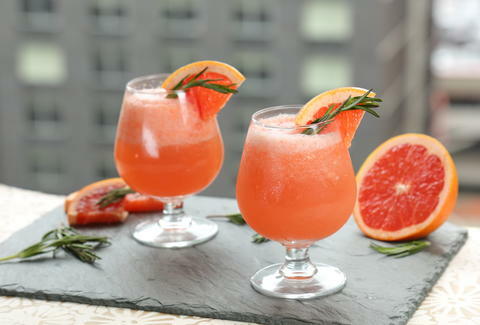 We're jumping head first into this Pizzazzerie-inspired frozen grapefruit rosé cocktail made with rosemary simple syrup and fresh, juicy grapefruits. If loving rosé this much is wrong, we don't want to be right. Bring water to a boil and add sugar and rosemary sprigs. Stir vigorously to allow sugar to dissolve entirely. Allow syrup to come to a boil once more and then remove from heat. Pour the syrup into a heat proof vessel such as a mason jar and refrigerate until entirely cool. Remove rosemary sprigs. In a blender, combine ice, Brut Rosé, rosemary infused simple syrup and ruby red grapefruit juice. Blend until mixture is a smooth, icy consistency. Pour frozen mixture into glass and garnish with rosemary sprig and serve.